Old pilings in Maine divide a town. Are they a treasure or a nuisance? 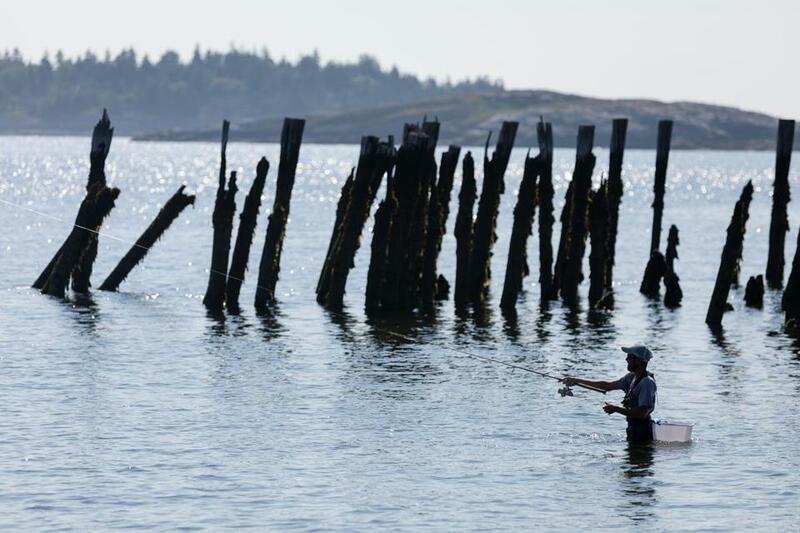 Chad Costello tried his luck near old wharf pilings off Popham Beach in Maine. POPHAM BEACH, Maine — A ragged cluster of rotting pilings juts from the water here, the cracked, crooked remnants of a wharf where 19th-century steamships from Boston and elsewhere brought throngs of summer visitors to seaside hotels. The wood pilings aren’t pretty, but they are treasured by families who have lived and summered here for generations, a stark yet familiar presence that recalls the beach’s storied past. Soon they could be gone, removed by a relative newcomer who has received permission to pull up this weathered piece of history from the state waters in front of his property. The dispute — a classic example of how one person’s nuisance can be another’s treasure — has ratcheted up emotions in a speck of a village that is better known for quiet days, pot-luck suppers, and spotty cellphone service. Maybe it shouldn’t have been: Popham Beach, one town official said, is believed to be Maine’s per-capita leader in property litigation. The picky details of boundary lines, which often were overlooked among longtime neighbors, are disputed more and more as newer generations acquire deeds, some residents said. Still, when well-to-do contractor Jackson Parker received state approval in June to remove the pilings, arguing that they cause erosion, a summer simmer turned to a boil. The wharf at Popham Beach in Maine was once a conduit for tourists to the summer haven. The town of Phippsburg, which includes Popham Beach, has appealed to the state’s Department of Environmental Protection to reconsider. In the appeal, the Board of Selectmen expressed concerns about “significant environmental damage to nearby marine life and maritime activities” if the pilings were removed, the possible release of cancer-causing creosote into the water, and the loss of an “iconic, emotionally stirring symbol” of the community, which boasts a 2-mile stretch of sandy beach as its prize attraction. The pilings harken back to the days when Popham Beach, a 50-mile drive north of Portland, served as a Gilded Age getaway, nearly three centuries after George Popham established a short-lived English colony here in 1607. 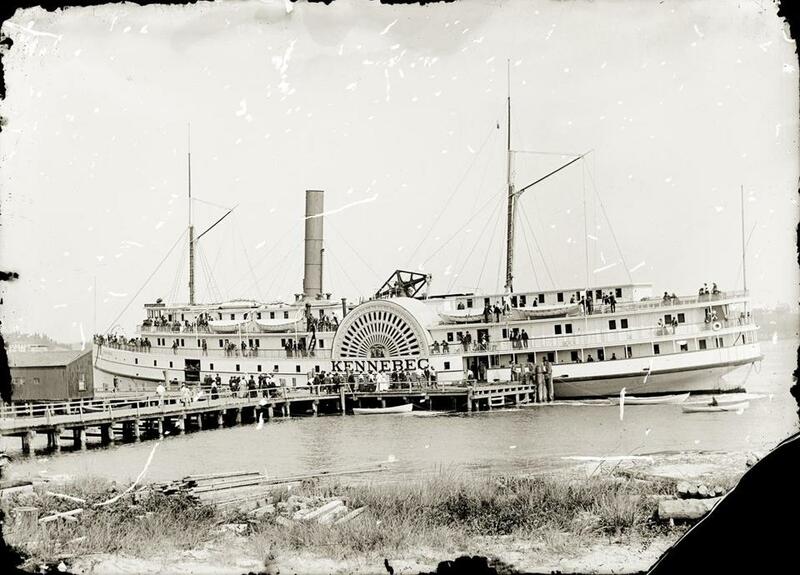 The steamship wharf became a focal point of the community, a place where locals mixed with wealthy visitors to swap stories and watch the hubbub. Selectmen contend that Parker has no legal standing to remove the wharf pilings, which sit in state property below the low-water mark at the mouth of the Kennebec River. Residents who oppose the idea said they are bewildered that their concerns do not seem to carry much weight. “Isn’t it just as legitimate if the person on the other side said, ‘I want it to stay.’ Does he own it any more than any of the other close-in neighbors?” asked Dot Kelly, vice chairwoman of the town’s Conservation Commission. Rafael Villamil, a Philadelphia architect and Victoria Villamil’s husband, said he has been frustrated by his dealings with the Parkers and the state. The state, in its decision, declared that the pilings had been abandoned and that it had no objection to their removal. While villagers wait for the appeal to play out, Parker remains adamant that the pilings should go. Many villagers dismissed that rationale as just so much fog rolling up the river. They noted that a study commissioned by Parker in 2012, required by the state before he could build near the beach, concluded that his new home will not be severely damaged if sea levels rise by 2 feet over the next 100 years. “When the same man comes back and says. ‘Panic, panic, I now have to get rid of the pilings because my cottage is threatened’ — wait a minute, buddy,” McNamara said. Photos taken over the course of a century do not show significant change to the beach behind the pilings, McNamara and others said. The Maine Geological Survey, a state agency, reported in January that its scientists cannot conclude with any certainty whether the pilings promote or prevent erosion. Parker insisted it’s his property that’s at risk. “Unlike those folks who see no downside to keeping the old piling, we have a choice to make: protect the piling or protect the beach,” he said. Opponents also wonder whether Parker has another motivation. One rumor is that Parker wants to moor a boat or build a dock off his two-acre property, where he built a large home after tearing down a Dutch Colonial. Parker scoffed at the notion. The clock is ticking, but many residents are holding out hope that the state will reconsider or that Parker will change his mind. The Conservation Commission, in a letter to the state, expressed another hope for the Popham pilings. 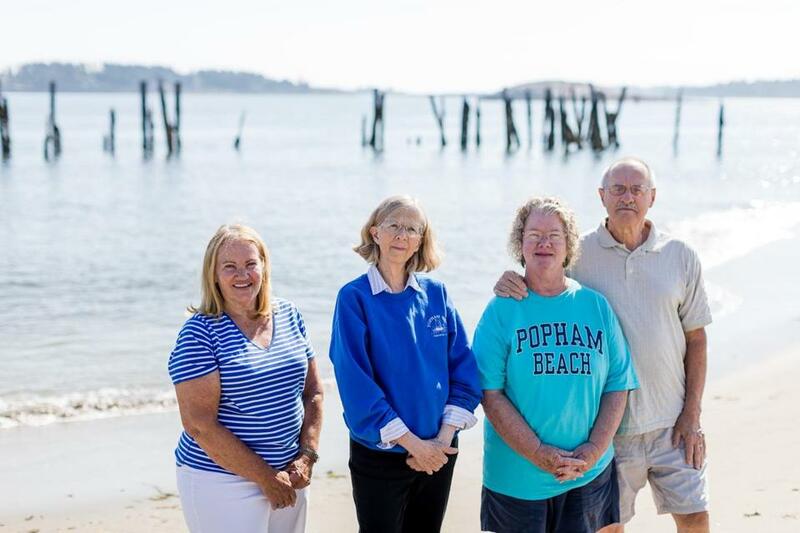 Some Phippsburg homeowners such as (from) Mary McNamara, Ellen Louise Hart, Jackie Gallo, and Jim Gallo want to preserve the remnants of the wharf.